The lesson is reflective of its context: so, too, must you understand an exhibition before you can decide to give it a name. Ten Climate Stories is worth the trip, but not for what it promises, ten different stories about the climate. Not so. The content of the exhibition can roughly be divided in half, between old 'stories' retold from existing collections in the gallery (such as the steam engines, the atom-splitter, and the rocket modules), and new stories based on artefacts which appear in the museum for the first time (such as Yao Lu's photographs and Thomas Thwaites' toaster). Overall, the exhibition is clearly laid out, with a variety of artefacts, media, and modes of presentation, and the path is linear enough to give a sense of coherence in time—no small order for an exhibition spanning nearly three hundred years in just ten fits. But still, the title. More accurate would be a title reflecting the exhibition’s actual focus: Ten Consumption Stories, or Ten Energy Stories. Only a few of the ten exhibits address either the climate or climate change, which becomes in this drama a background player lurking in the wings, waiting for its entrance onstage—an entrance that, with everyone else already having played their part (the exploration and discovery of natural resources, the history of scientific pursuit, the surge of private, public, and corporate development, and the ongoing artistic and cultural response) scarcely suggests a happy ending. In some cases, such as the third 'story' (an early photograph of Earth from space), the reference is barely even implicit. It feels as though, trying to drum up additional interest for its brand-new climate change wing, the Science Museum has positioned the word 'climate' as the bait before the switch. This studious neutrality is perhaps reflective of the exhibition's sponsorship, partly from Shell Oil, and the risks in curatorial tone the Museum may have had to limit. The sheer brevity of the panels, and their often yawning generality, leaves the question open. More disappointing than any possible sin of comission, however, are the sins of omission: the absence of any narrative of renewable or sustainable sources of energy anywhere in the hall. The closest the exhibition comes is the following non-statement before the atom splitter, a few feet away from Ford's motorcar: “[Burning] fossil fuels such as coal to generate electricity has long been under scrutiny and alternatives are being closely examined.” Not that any are named, especially those so obvious (and free) as sunlight, wind, or water, anything that might one day temper profit margins. Jem Finer's Longplayer, a musical composition that is intended to play unbroken for a millennium—from 1999-2999—is perhaps the most compelling of the three. Sit with it long enough and the realisation dawns that the bright pings that penetrate its deep, sonorous bass rhythms resemble those infrequent yet urgent reminders pinpricking our environmental consciousness. Warnings of overconsumption, of tipping points, the onset of new disasters and the release of new, alarming indicators: each of these comes to mind amid the background hum of daily life and habits. But in our minds as in the hall, too easily they are dismissed or ignored, leaving us only with the rhythm of the bass coursing through our body as we sit, a rhythm that we continue to take for granted long after we have stood and walked away. All told, Ten Climate Stories is worth seeing not for what the title promises but for what it delivers without broadcasting in advance: smaller moments that reveal much both about our relationship to the earth and its resources, and, crucially, about the way that museums and other institutions of knowledge tell those stories themselves. Like Edward Said's proverbial map, any narrative-based exhibition ultimately tells a story about itself as much as its objects. That the story this exhibition tells falls short of its own mark is to be lamented; that it manages to reward its audience despite its own intentions is a lesson from which museumgoers and museum alike could learn. Benjamin Morris last reviewed Uncivilisation: The Dark Mountain Festival for Ashdenizen. His work appears or is forthcoming in The Rumpus, Horizon Review, and Dark Mountain vol. 2. Having recently completed a PhD in Archaeology at the University of Cambridge, he is now a researcher at the OpenSpace Centre for Geographical and Environmental Research at the Open University. The decision to switch on a lightbulb is deeply rooted in a mythology which most of us don't even know we have absorbed. An annual event, the Artangel Longplayer Conversation brings together two cultural thinkers to engage in a conversation that's inspired by Jem Finer's Longplayer, a musical composition playing in real time across the millenium. My latest "Going Green" column picks up on how Mary Wollstonecraft (left), author of “A Vindication of the Rights of Woman”, explained what thinking was to her young daughter: it was about noticing there was someone else in the room. what happens when you turn on a light switch? A 2009 Tipping Point winner, The Light Switch Project, will be broadcast on Tuesday, 19 April, on BBC Radio 4, at 11 am. 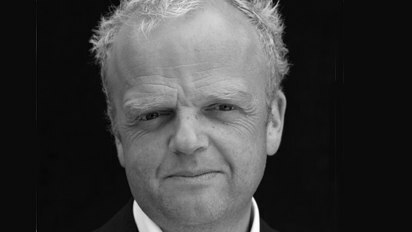 The story follows the actor Toby Jones as he tries to figure out what happens when you flick that switch. 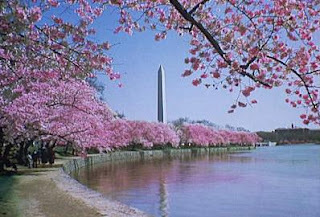 The cherry blossoms are in full bloom in Washington, DC. This is the nation's signature sign of spring, and the city celebrates their arrival with a festival. Up north in Boston, our editor, Kellie Gutman, spotted her first daffodil yesterday. Her postcard to the Padeia School, in Atlanta has been filled in with the date of April 5 and sent to them for their charting of the speed of spring's advance. Meanwhile, in a recent comment, Robin Dally googles the number of people showing any interest in "the signs of winter".